The best way to experience your vacation is on your own Key West Scooter Rental or on a Key West Electric Car Rental! There is nothing like strolling around on your Key West Vacation in Key West by scooter or electric car. With Key West Only measuring about 3 miles by 1.5 miles our streets are narrow and parking is very limited. 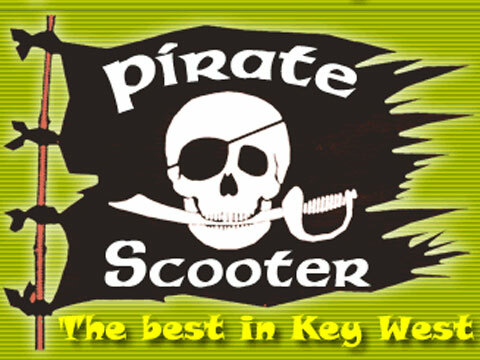 Key West Scooter Rentals with Pirate Scooter Rental Company is the premier place to rent Scooters and Electric Cars when you're in Key West, FL. We are open 9:00 am to 9:00 pm 7 days a week. Our trained staff offer free training to ensure your safety. We want your stay to be as enjoyable as possible, after all you are going to be on a vacation. Of all of the Key West Scooter Rentals and Key West moped companies we are one of the few that offer damage waivers. These are to guarantee your piece of mind whilst experiencing Key West. Pirate Scooter Rentals of Key West has a large inventory of scooters and electric cars, we are proud to say we replace our cars and scooters on a regular basis. We also offer free gas and refills. Our staff will be sure to point you in the right direction for things like restaurants and water sports. Renting a scooter or electric car is as simple as producing your drivers license or credit card. (Visa, Mastercard and Discover) All drivers must be 18 years or older. We welcome your business and hope that you have the time of your life in Key West. We are conveniently located half a block off of Duval Street, across the street from the World Famous Green Parrot Bar ( 401 Southard Street ).